The most comfortable socks you will ever wear. Try one pair and feel the total comfort and benefits!! 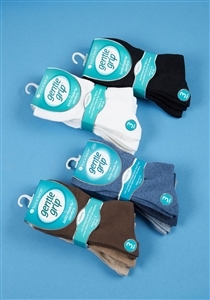 These 3 pairs of Gentle Grip socks come with a honeycomb top which has been crafted to carefully and comfortably grip the contours of the leg, without any constriction. The cotton rich material provides supreme comfort that is perfect for anytime wear. 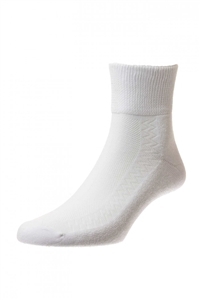 Bed Socks are popular with those who want to relax with their feet cosy and warm, and ideal for those who suffer with cold feet or poor circulation. These Bedsocks feature the a non-elastic top to improve comfort. They are also 100% synthetic, so the socks remain fresh for longer. Comes in a pack of three - your choice of either assorted dark colours or brown and fawn. *Please note, packaging may vary from the original picture* A seam free sock, suitable for diabetics, with a gentle grip honeycomb top and non-restrictive toe seams. 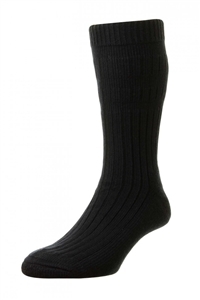 3 Pairs of Mens Timeless Knee high wool-rich socks! With comfort top. The Ultimate - The very best in travel-safe anti-dvt socks contains 78% cotton. You cannot get any better! Ideal for long plane, coach, train or car journeys and long periods of inactivity, these cotton-rich travelsafe socks offer graduated compression up the leg which helps to improve blood flow back towards the heart. These high quality cotton-rich socks have a loose top, and so are less restrictive. This provides extra freshness and comfort. The sock is designed with three unique relaxation panels, which contract vertically so the socks stay up in comfort all day long without leaving marks on the legs or restricting circulation. Proven comfort, and highly recommended for those with circulatory problems.